Chronic diseases that need to be treated over a lifetime are costly – both in quality of life and dollars spent for medical care. During the past year, the Alaska Section of Chronic Disease Prevention and Health Promotion worked with two different organizations to determine if strategies the Section was implementing would save money over time. Both analyses showed significant cost savings to the state. In February 2014, the Section’s Diabetes Prevention and Control Program examined the cost savings that resulted when Alaska adults with diabetes participated in a disease management program. Evergreen Economics analyzed medical care costs of Medicaid recipients with diabetes who attended a chronic disease self-management program (CDSMP). Evergreen found a 21.7% reduction in the annual Medicaid spending for Medicaid recipients with diabetes who attended at least one CDSMP class compared to those recipients with diabetes who did not attend any CDSMP classes. If all of the estimated 6,300 adult Medicaid beneficiaries with diabetes had attended a CDSMP course, the total savings to the Medicaid program could have reached $36 million dollars for fiscal year 2014. Participating in the disease management program also meant significant improvement in blood sugar measurements, body mass index and blood pressure among Alaska adults with diabetes. In addition to supporting disease management programs, the Section’s diabetes program provides public education and education programs for professionals, as well as partners with health care providers and other organizations to reduce the burden of diabetes in Alaska. 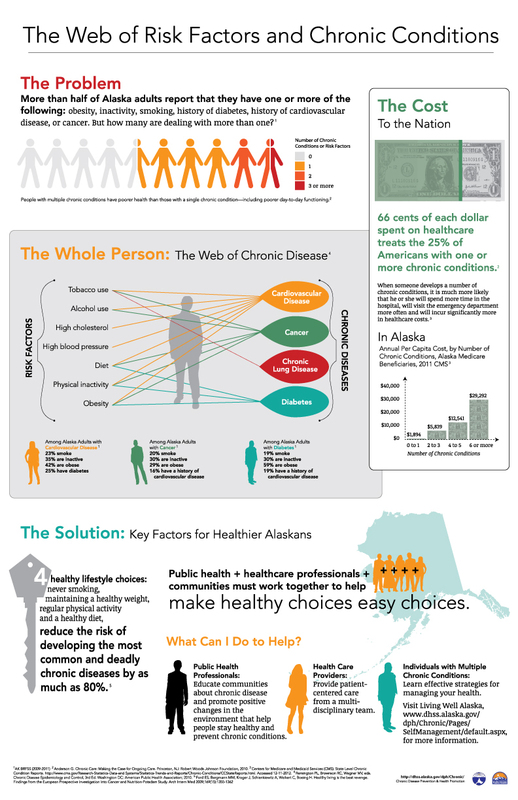 Medical care related to obesity costs Alaskans $459 million annually. State and federal governments pay for more than 25% of these costs in the form or Medicare and Medicaid. Medical care costs are expected to increase. An international research organization estimates that the direct medical care costs related to treating the consequences of obesity will represent 20% of all health care expenditures by 2020. In fiscal year 2014, the Section worked with the University of Alaska’s Institute of Social and Economic Research (ISER) to estimate the return on investment of preventing and reducing childhood obesity in Alaska. Obesity puts Alaska’s adults and children at risk for diabetes, heart disease, and other chronic conditions. It also puts stress on their joints, bones and organs. ISER estimates the medical cost of childhood obesity will top $625 million dollars over the next 20 years when considering just the group of children and adolescents who were ages 2 to 19 in 2012 in Alaska. The university’s research institute used this 2012 cohort of children to estimate obesity-related medical costs over 20 years for that group only. The study concludes that reducing obesity rates by 1 percentage point in this 2012 cohort of children would save nearly $17 million in medical costs over 20 years. Decreasing the percentage of non-obese kids who become obese adults by 1 percentage point would save over $14.3 million over 20 years. 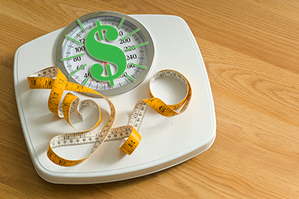 Dropping the percentage of obese adolescents who become obese adults would save another $2.9 million. While there has been success in decreasing the prevalence of childhood obesity in the Anchorage and Mat-Su regions, progress has stalled. The rate of childhood obesity in these regions has stabilized and remains high; 16.8% of students in these communities’ school districts are obese said Karol Fink, director of the Obesity Prevention and Control Program (OPCP) for the Alaska Department of Health and Social Services. About 1 out of 3 children in Alaska are overweight or obese. There is no single strategy that works by itself to prevent obesity. For that reason, the Alaska Obesity Prevention and Control Program supports multiple strategies that work together to prevent and reduce childhood obesity and reduce medical care costs now and in the future. Those strategies include working with partners to prevent and reduce obesity. OPCP issues grants to eight school districts across Alaska to help update the districts’ wellness policies, increase opportunities for physical activity, and improve the nutritional quality of the foods available through schools. For the past three years, OPCP has run Play Every Day, the public education campaign that raises awareness about childhood obesity and motivates Alaska families to be more physically active and choose healthy drinks for the best health. Play Every Day is a partner of the Healthy Futures program, which runs a free physical activity challenge in almost 200 elementary schools across Alaska. OPCP also supports efforts to make fresh produce, fish and other healthy foods more affordable and accessible to all Alaskans. Evergreen Economics. Memorandum to AK Diabetes Prevention and Control Program, May 30, 2014, Accessed 12/15/2014. Trogdon JG, Finkselstein EA, Feagan CW, Cohen JW. State- and payer-specific estimates of annual medical expenditures attributable to obesity. Obesity. 2012;20(1):214-220. Finkelstein EA, Trogdon JG, Cohen JW, Dietz W. Annual medical spending attributable to obesity: Payer- and service-specific estimates. Health Affairs. 2009;28(5). w822-w831. RAND Corporation. Obesity and Disability: The Shape of Things to Come. Rand Corporation: Santa Monica, CA; 2007. Accessed 11-24-2014. U.S. DHHS. The Surgeon General’s Vision for a Healthy and Fit Nation, U.S. DHHS: Rockville, MD; 2010. Guettabi M. Current and Future Medical Costs of Childhood Obesity in Alaska. Anchorage, AK: University of Alaska Anchorage, Institute of Social and Economic Research; 2014. Accessed 11-26-2014. Centers for Disease Control and Prevention. Obesity in K-7 Students –Anchorage, Alaska 2003-04 to 2010-11 School Years. MMWR. 2013;62(21):426-430. Alaska Department of Health and Social Services. Student Weight Status Report for the Anchorage Metropolitan Area 2013-2014 School Year; 2014. Accessed 11-26-2014.